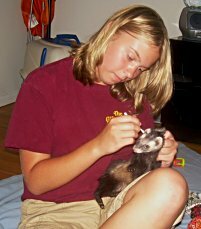 It's a struggle all rescues go through during the adoption process in a world where it is difficult enough to find adults willing to make the commitment to a ferret companion. Some rescues have a policy that without exception they do not adopt out to families with small children and do not let teenagers under the age of 18 adopt. 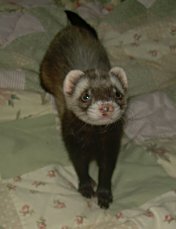 While I understand the reasoning behind this; ( I have seen and heard horror stories about what has happened to pets left to children unsupervised) and would not by any means chastise other rescue's policies, we have found some very exceptional young people that have turned into some wonderful ferret adoptions. They are definitely few and far between, that's for sure, but they are out there and some have exhibited such exceptional responsibility and care for ferrets (with the proper parental involvement and supervision) that we would have done a dis-service to the furkids and the families had we not at least given them them the opportunity to exhibit their level of responsibility. As a result, we have found some wonderful homes for several of our furkids. These families inspired this special page highlighting especially responsible children, proving that they are not all alike and do not deserve to be classified as irresponsible based on their age. 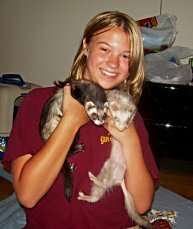 Lisa has been a most wonderful teenage ferret mom. She has kept in touch with me throughout the life of her adopted fuzzys and I recently received this email from her. Good luck in your future Lisa. It is bright and full of wonderful things! Dear Kim, Unfortunately you are correct in your prediction. The furkids are no longer with me :'-( Snow had begun to slow down and was not happy with Jynx sleeping with him. He started to be aggressive towards her and I had to put them in separate parts of my ferret nation cage (I absolutely LOVED that cage!!) I had Snow euthanized June 22nd 2009. Jynx was fine alone because she was used to sleeping by herself and I was able to let her out for the majority of the day and she was quite content with playing with my Weiner dog and sleeping under the covers on my bed and biting my toes. I started working at Quakertown vet clinic and about a year ago a coworker had just lost her ferret and was telling me that she only had one ferret left. I told her that I also had a single ferret and we decided to try to get them together to see how they would do. I took Jynx over a few times and we throughly enjoyed watching them play and wrestle together. My friend only worked three days a week and was a stay at home mom for the other days. I had been working 36-38 hours per week and going to school, I was home a lot and as I said Jynx was out a lot because my mom was unemployed and let her out everyday she did not get the chance to wrestle and play like she used to. I went on a two-week vacation to Florida and asked my friend to watch Jynx while I was away and when I went to go see her after I got home she just seemed so comfortable there and my friend's daughter had fallen in love with her because of how much she loved to cuddle so I suggested she keep my little girl and give her the play time she deserved, and about two weeks later I got my letter in the mail that the college was very interested in me so I was happy I found her a home instead of moving her to Maine. When Jill started emailing me about one of her co-workers that was looking to adopt ferrets, I already had that "gut" feeling that this would be a good, positive experience. After talking to mom-Dawn Eslinger and an initial visit with her girls Addison and Kendall, I knew we'd find them some fuzzys to love . Their story and more photos are included in our Happy Endings Page but I've included a couple here also. 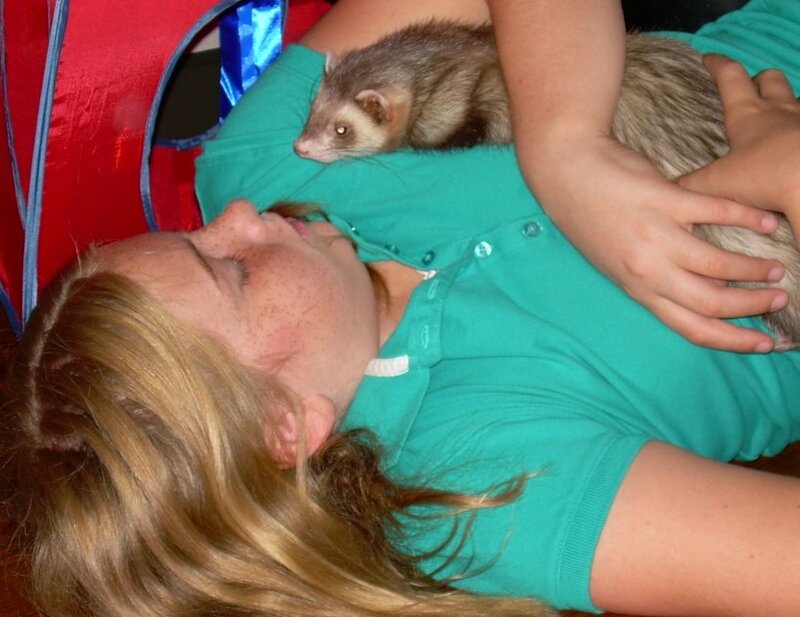 Dutch, a real cuddler, was a great match for the kids as they wanted a lap ferret to watch TV with. Miss Einstein and Rose were also part of the bonded group and were invited to come home with them too. All follow ups for the past several months have indicated that all is well and the kids continue to take responsibility for their furry companions. The family was even kind enough to take on the additional responsibility of fostering two young furkids while I recovered from surgery…which presented a challenge with the fur family they had already adopted. In spite of it all, the family saw it through until I started to get back on my foot again and we are forever grateful to them for their help. Addison and her new furry friend, Rose. While giving her a loving cuddle. 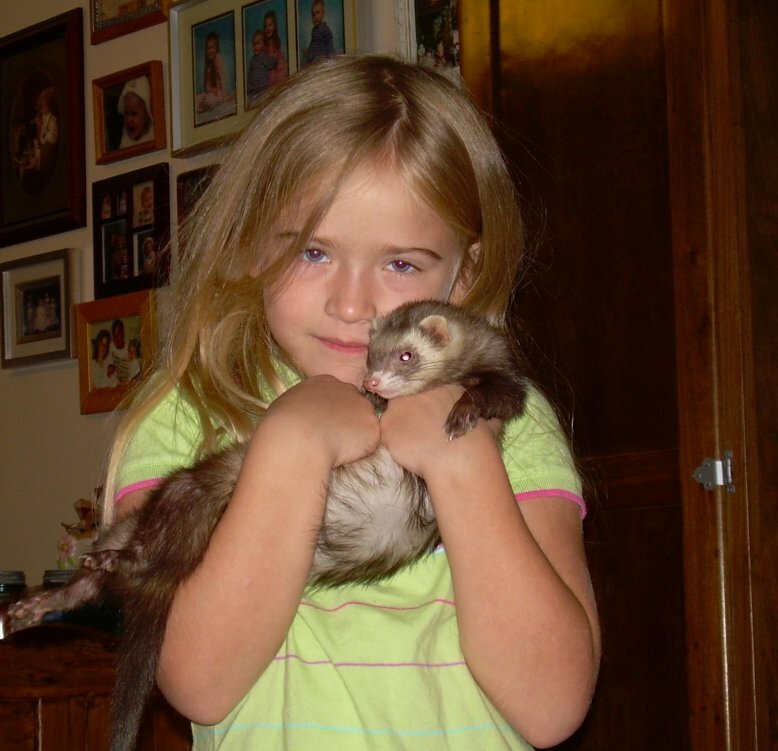 Kendall and Dutch, her new lap ferret. climbing into his young mommy's arms. Lisa and her new kids. Lisa learns how to clean ears. When Lisa contacted me via email about adopting, I could tell she was young but I never would have guessed that she was only fifteen by the mature tone in her writing. I could see that she was fearful of letting me know how old she was so I just sat on it while we chatted about ferret care. This young lady aspires to work with training dogs for the police K9 unit when she graduates and proved beyond the shadow of a doubt that she was responsible to all the animals that have come through their front door. I could tell that animals are her life. After several emails, we began getting into the details of the adoption process, when she finally had to come clean with me about her age. "Please don't hold it against me", she begged. I tried to adopt from a local rescue but they turned me down just because I wasn't eighteen. Lisa was completely new to ferrets but had already begun her research by investing in the book, "Ferrets for Dummies". 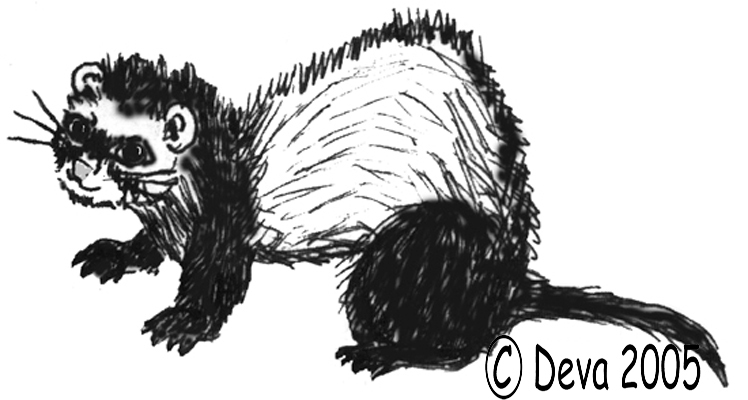 We had kids of all ages available but she thought a middle age, somewhat settled ferret would be better for her as "starter ferrets". She was also willing to adopt more than one if they were a bonded group. The first group that came to my mind were Jynx and Snow. Their human had been murdered and the only human contact they had for the past seven months was about one hour a day when their grandmom came to take care of them. It was a very lonely time for these kids but grandmom had a hard time parting with them….the only living reminder of her son. When they arrived at the rescue, I found that Snowman was adrenal. Their grandmom graciously offered to pay for his adrenal surgery to help he and Jynxie become better candidates for adoption. When Lisa heard about their story, and saw their pictures, I could see a bond beginning to develop. It would be some time before we could consider them for adoption as Snow still needed adrenal surgery, but Lisa was willing to wait. Additionally, she was willing to provide special health care for Snow for his life, if need be. 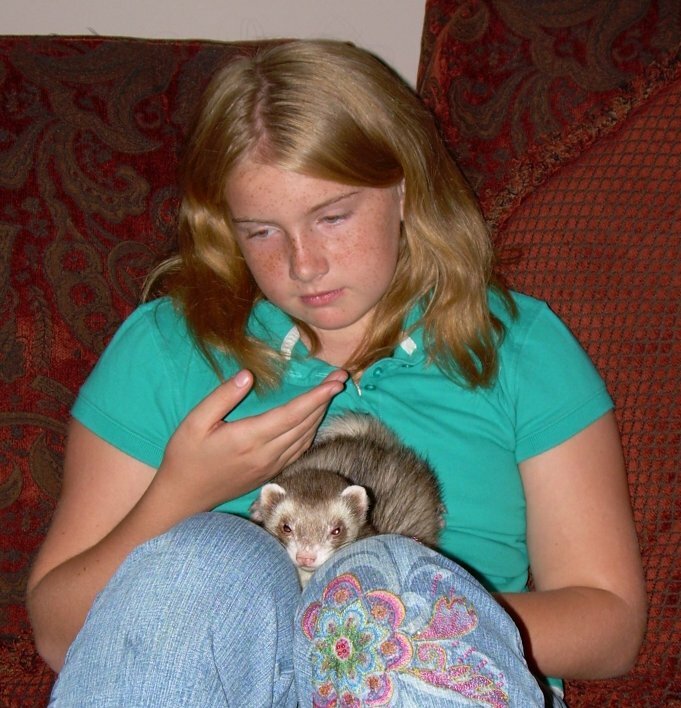 Mom cautioned her and encouraged her to consider younger, healthier ferrets but Lisa stood her ground. "Mom", she politely explained, "With all the discussion and pictures I have, I already feel like they're mine. I can't let them down." Snow made it through the adrenal surgery where the vet also found some pancreatic tumors indicating the beginnings of insulinoma. My recommendations were chicken gravy (aka duck soup) with a small dose of prednisone for Snow's life to help ward off potential insulinoma crashes. Lisa agreed to do whatever was needed for Snow and adoption day was scheduled. In addition to the adoption fee, this exceptional young lady was also willing to cover the travel (gas) expenses to bring them to her, as she lives two hours away. I arrived with the kids and a small supply of chicken gravy to help Lisa get started. It was like Christmas for Jynx and Snow. She had purchased all the necessary supplies PLUS an array of toys and bedding. Combined with the adoption goody bag the girl scouts made, the kids were off to a wonderful start with all kinds of new goodies. We went over all the grooming basics and I could tell the kids were happy but wondering why they couldn't stay with me. Adoption day is hard for me and I must appear rude sometimes as I kiss the kids and rush out the door as I try to hold back the tears. Lisa has followed up with me daily on the adjustment, indicating that they are playing and even being cuddly. Apparently, Snow is quite the shoulder ferret! Another happy ending with an exceptional young person that many adults could stand to learn from.